I have a million cupcake recipes, but when I need cupcakes for an event, I still find myself scrambling for the perfect recipe to fit the occasion. Luckily, that wasn’t the situation this week. In fact, it was in reverse. I found this easy and good looking cupcake recipe, then got an email reminding me the Girl Scouts were meeting here. Perfect. In a matter of minutes, these were whipped up and in and out of the oven. As for the icing, I was completely out of powdered sugar and decided to try no-powdered sugar vanilla icing. The icing isn’t exactly quick, but it is easy if you have a stand mixer with a whip attachment. It takes a lot of whipping to get the sugar to dissolve, but with the stand mixer you can just leave it while you do other things. The cupcakes were really good. You can’t taste the lemon from the lemon juice (which is there to add acid) and they’re definitely moist and light. The icing was interesting. It reminded me of a slick buttercream and had a very clean flavor, but it wasn’t as good as true buttercream — something I need to practice making (the kind with egg yolks — not the recipe on the back of the sugar box). Anyway, it’s nice to have an easy scratch cupcake recipe like this. I plan on using it as a base cupcake while I work on interesting fillings and frostings (and getting over my issues with making true buttercream). Thanks so much for reviewing the cupcakes! I hope you find some more recipes you like. Wow! These tasted great! I did the Buttercream cupcakes. Amazing! I love this place! I just was looking up a recipe for snack for my 1st and 3rd grader. They loved them! Even my husband got so stuffed he couldn’t sleep. It was so much fun too. Crisco is fine by me too. Maybe it would be a “natural” for “I Can’t Believe It’s Not Butter”. 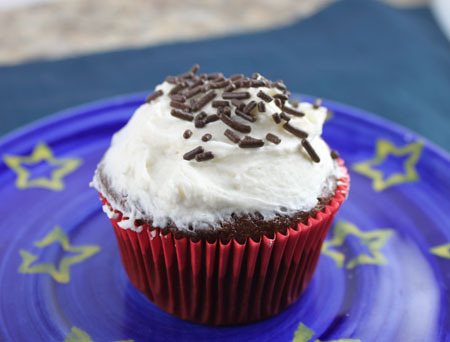 Have you tried adding 2 Tablespoons of cocoa to the frosting? That seems to be the right amount for the recipe. I’m going to try it soon. Louise, I don’t use Spectrum. Some people can taste the palm oil and I found out I’m one of them. Several recipes I saw for this call for half shortening and half butter. People seemed happy to use Spectrum. The flour-paste buttercream used on the Waldorf Astoria cake originally called for Crisco – ick! I tried using all butter and wasn’t happy with it. Now I use stick margarine which I think is the happy medium. We like this icing cold so I store the cake in the refrigerator. Christie, what a coincidence! I do have a similar recipe that uses flour and powdered sugar, but I don’t care for that one much at all. As for the graininess, some versions of this recipe use super fine sugar which probably helps make the job go faster, but I hardly ever have super fine sugar on hand. I had to look back at the frosting I used for Red Velvet — the one I really liked and which reminded me of Hostess cupcake filling. Here it is. It’s almost the same as this one but has salt and less flour. I almost sent you a post yesterday to ask if you have ever made this cooked frosting! I can’t believe the timing. I tried it this weekend and despite whipping w/ a kitchen aid for 10 minutes, it was still grainy. After it sat overnight, it became creamy. Can you sub powdered sugar for the granulated? How is the red velvet frosting different? I used the frosting as a filling for “hostess” style chocolate cupcakes from Cook’s Country after their suggested recipe for filling was a flop for me. I always appreciate your quest for the best! i love cooked flour frosting! i tried it for the first time too when i was out of powdered sugar. i like the texture, and i think it’s good for cakes where you really want the flavor of the cake to stand out…not as sweet as powdered sugar buttercream, so it doesn’t overwhelm anything. Looks good! It’s always good to have a quick cake recipe on hand. One trick to making less sweet powdered sugar icing is to add the powdered sugar really, really slowly while continuing to beat the butter. It’s possible to make a nice frosting while adding a lot less total powdered sugar. Thanks for not pointing out my typo! I called it No-Powered Sugar icing. Lisa, I used natural. These might actually worth with Dutch. I’m not sure how much acid is actually needed. Kathy, I’ve made the Red Velvet type and like it better. I should have just made that one. This one is less fluffy and more slick. Blake, this was a lot less sweeter than powdered sugar icing. It was more fatty than sugary. Darlene, I’ve failed at this type of recipe too. I think the time I failed I used too much flour and the roux was too thick. Laura, I am not familiar with Toba Garret but I’ll look her up. It didn’t remind me of ice cream, though. Stephanie, that sounds interesting too. It would be fun to compare the recipes. This one also reminded me of a buttercream made with marshmallows. I’ll see if I can dig up that one if anyone is interested. I have a similar recipe but instead of flour it calls for cornstarch. It is great & not too sweat. You make like an unsweetened milk pudding with the cornstarch & milk, then whip it into the butter & sugar. It taste almost like a whipped cream. Toba Garret likes this kind of icing, she a recipe like this in her first cake decorating book–she says it reminds her of ice cream. Usually I am very successful with following a recipe, but I tried a similar cooked flour icing recipe that required this technique and it failed miserably. I’m not sure if I didn’t judge the timing on the roux properly, or just how cool it needed to be before proceeding to the next step. I may have to try it again and hope for the best. It’s so funny you’re posting this today, as I was just looking for a recipe of this type. I’ve been rather unhappy with the powdered sugar frosting lately – too sweet. Would you say this is less overwhelming with sweetness? I really want to try Swiss Meringue Buttercream, too, but always seem to hesitate. Have you tried Martha’s: http://www.marthastewart.com/recipe/swiss-meringue-buttercream-cupcake-book? My mother used to make a similar cooked/flour-type icing for red velvet cake.